• Invoice processing for timely billing and accurate booking of the transaction to the customer’s account. 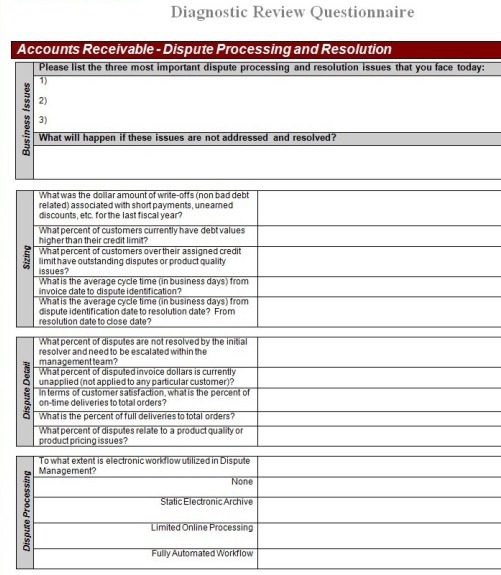 • Collections and dispute resolution for ensuring cash flow is both on-time and actually received. • Operations is both efficient and cost effective. A section of the questionnaire we use for gathering information related to Dispute Processing and Resolution is shown above. The information collected from these questionnaires is used to create a base line of a company’s current system. The base line is then used in measuring performance against company goals, industry best practices and peer group survey data. The intent of this exercise is to identify areas of improvement, quantify the loss in cash flow or increases in costs, and start to investigate alternatives. The increased operating costs, diminished customer experience, and reduced cash flow are the reasons we focus our attention in this area among others. With the information from the questionnaire, we start the process of identifying the root causes of the disputes in the first place. Transactional level data is used to perform this analysis by identifying patterns, relationships and outliers that point to causes. Our recommendations can vary from resolving product quality issues, delays in shipping, pricing communication issues, etc. From a processing standpoint, we often recommend the isolation and exclusion of problem receivables from the normal collection process. Disputed invoices are worked by a dedicated staff while regular collectors handle normal late payers with the highest likelihood of recovering past due balances. Workflow, approvals, customer communications, and documentation processes are all designed to be efficient and effective as possible for the company’s staff and environment.